ENSURE THE TRUSTED DATSUN EXPERIENCE WITH GENUINE ACCESSORIES. 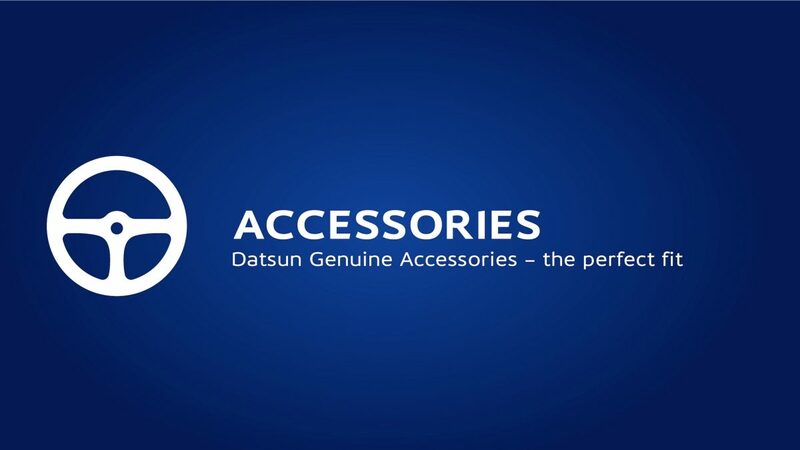 Our Datsun Genuine Accessories are developed exclusively to fit Datsun vehicles. So keep your car happy with the Datsun Aftersales treatment. Datsun Genuine Accessories are specifically designed and manufactured to give you excellent fit, reliability and performance without affecting your vehicles warranty. From protection or convenience, to personalisation, safety or technology - a wide range of Datsun accessories are available to customise your Datsun to suit your personal lifestyle and fitted by our expert technicians to ensure safety standards are not compromised. Always insist on Datsun Genuine accessories, and keep the romance alive. It’s what your Datsun deserves. To find out more about the accessories that you and your Datsun will just love, visit your nearest Datsun Dealer.